For first-timers or veteran Easter Egg makers, this guide has everything you need to get started. Make sure to share your tips with us. Here’s what you need to make your homemade Easter Eggs. Homemade Easter Eggs: Simple How To Guide. Once melted, stir in 1/4 of the remaining chocolate to temper. Stir with the spatula until all has melted and smooth. Set aside in the refrigerator for 10 minutes. Repeat step 4 and 5, 2-3 more times to build sufficient wall thickness. 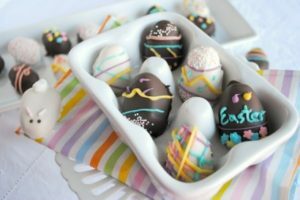 Holding one egg half, brush a small bead of melted chocolate along the edge, add the optional filling candy to the egg and press the other half gently to create a seal. Refrigerate. To create a marble effect, use the basting brush with excess white chocolate to create a drizzle pattern on the mould. Use a different brush and then drizzle with regular chocolate. Refrigerate for 10 minutes and then build up the wall with regular chocolate as above. Watch this video from All Recipies to see how to make the marble effect on your homemade Easter egg yourself and a summary of these steps. Pour white chocolate or coloured chocolate into a piping bag or wax paper cone with the edge cut off. 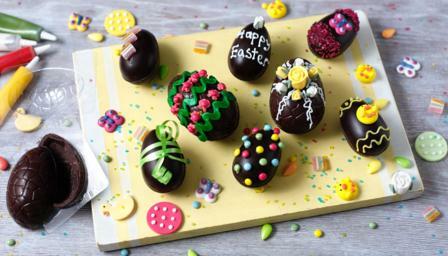 Draw your design onto the hardened chocolate eggs. Add Candies and other decorations by adhering them with blobs of milk chocolate. Learn How to Decorate an Easter Egg. If you are looking for other great seasonal treats for your family that are easy to make, check out our Easy Christmas Treat for Families Post. If you liked this post, share it on Facebook or Twitter. Tag Us and let us know what you think. Subscribe to our newsletter below for more recipes and fun news.